Buckle up, Breaking Bad fans! According to The Hollywood Reporter, a movie set in the Breaking Bad universe is in the works, and series creator Vince Gilligan is once again at the helm. It's been 10 years since the hit AMC show premiered, and five since it ended, yet viewers still miss the dark and dramatic story of Walter White and Jesse Pinkman. While details about the film remain unclear, the two-hour movie will reportedly follow a kidnapped man as he escapes and seeks freedom, and it will begin filming in New Mexico next month. It's still unknown whether fans can expect the movie in theaters or on the small screen. Cranston also said he'd be willing to rejoin the cast and reprise his role if Gilligan asks him to, adding "There's a lot of people who felt that they wanted to see some kind of completion to some of these storylines that were left on. And this idea, from what I'm told, gets into those - at least a couple of the characters who were not completed as far as their journey." He also admitted if "there is an appearance, or what kind of appearance - flashbacks, flash-forwards, I have no clue. But I'm excited about it because it's Breaking Bad and it was the greatest professional period of my life, and I can't wait to see all those people again, even if I just come by to visit." 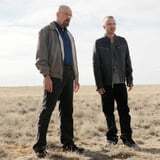 Aaron Paul, who played Walter White's partner in dealing, Jesse Pinkman, also shared his thoughts on the movie and the possibility of him returning. In an interview with The Wrap's "Shoot This Now Podcast," Paul said, "I'd like to think it may be kind of easy and seamless to jump back into that guy because we live and breathe all of our characters that we play, and I played this guy for seven years. I really know him. It'd be fun to put back on those shoes."